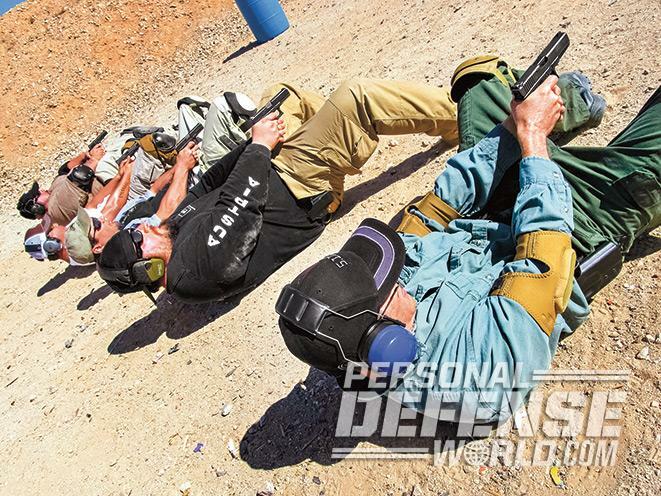 Your handgun training should include firing from unconventional, realistic shooting positions. 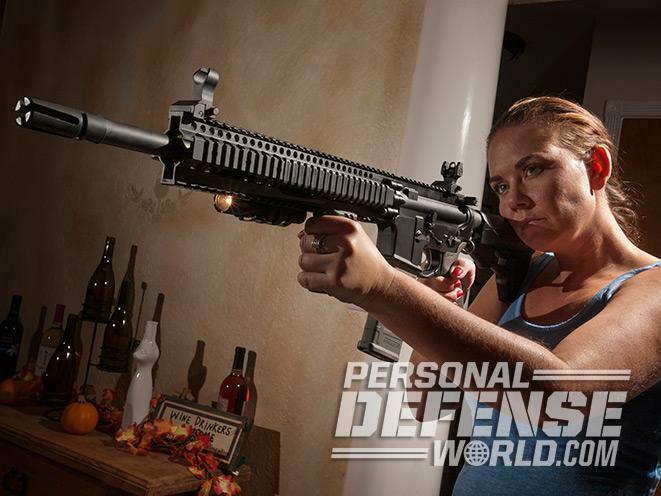 AR-style rifles are extremely popular because of their high capacities and terminal ballistics. It’s 3 a.m. and a noise downstairs jolts you awake. Your mind is scrambling when it comes again—angry voices and the sound of movement. You have your entire family in the home and they are spread across multiple rooms in the house. Your worst fear has just become a reality and it is time to step up and defend your family. The question now is which weapon will serve you best in this situation. While the above scenario is obviously fabricated for our story, it has been played out hundreds of times in reality. 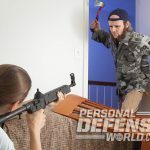 Long before a situation like this arises, you should educate yourself on what firearm will serve you best. 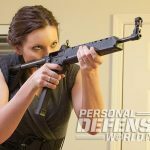 There are few things as vigorously debated as what is considered the “perfect” home defense gun. Some swear by the shotgun while others go the pistol or rifle route. 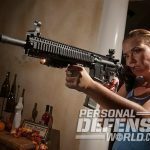 There are many unique factors that you should consider when choosing a gun to use in your home. How is your home laid out? Do you have a large home that allows for easy maneuverability or a small home? Do you have thick block walls or thin drywall? Are you in a single-family dwelling or an apartment with neighbors on all sides? All of these items are points you should take into consideration before you choose a handgun, shotgun or rifle. Regardless of our home design, we should pick a gun. Each of these weapons has strong pros and equally strong cons. Let’s break them down and explore the upside and downside of each and let you decide which one fits your needs. 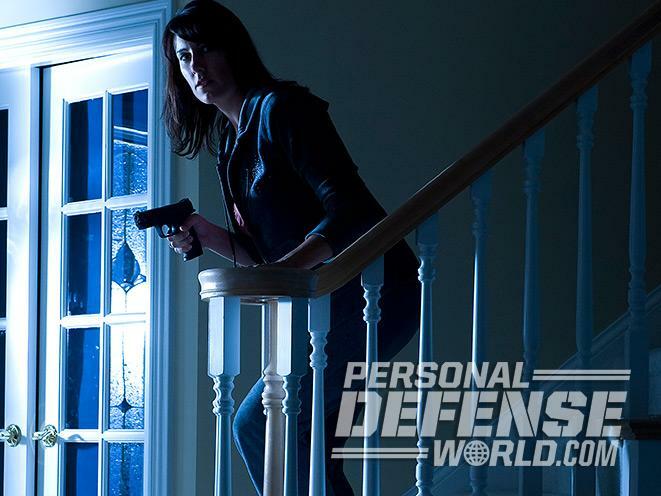 The handgun is the most prolific weapon seen in home defense arsenals. Its popularity is also based in its ability to be taken along as you leave the house for day-to-day life. 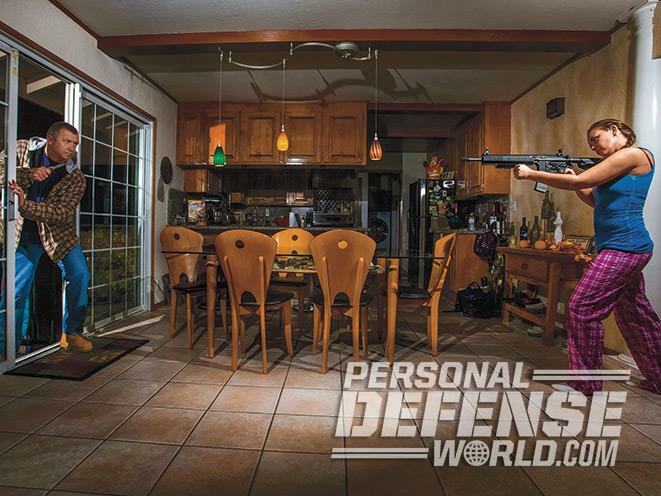 The pros of a handgun for home defense are many. First off, the handgun is the smallest of our choices and easy to store. A handgun safe can take up less room than a shoebox and can be mounted anywhere inside the home. 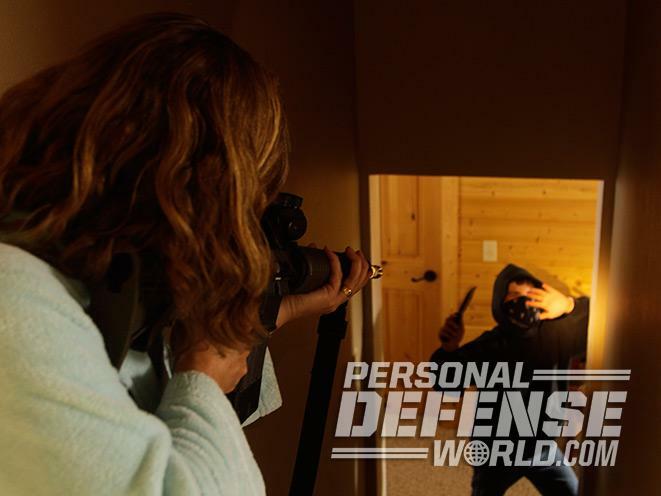 In fact, a current trend is to have two or even more safes placed within the home to avoid having to dash to a gun in an emergency. The size of the weapon also allows it to be wielded easily in close quarters. It is simply easier to use a smaller gun inside structures. 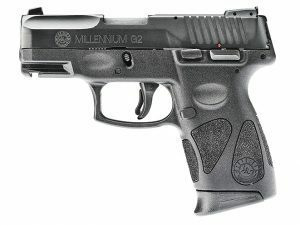 Modern semi-auto handguns can have the capacity to hold a large amount of ammunition as well. 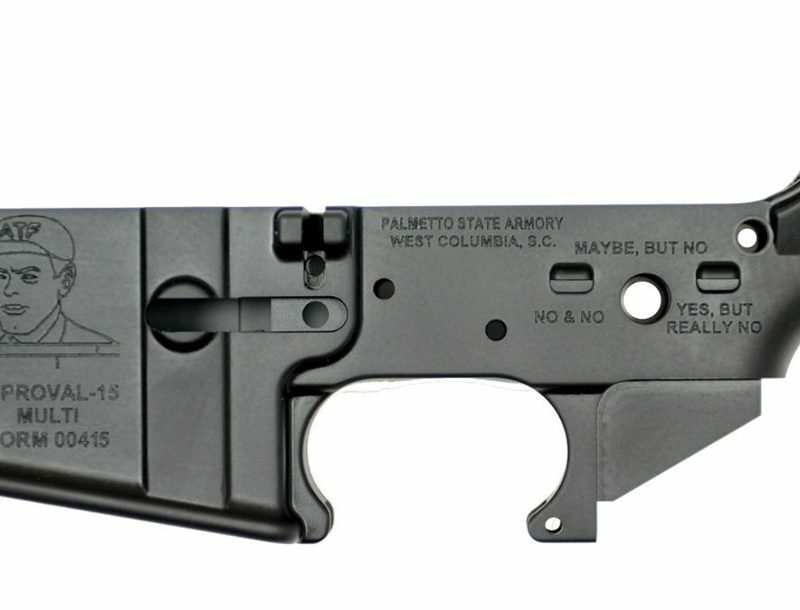 A standard magazine can hold 17 or more rounds. This brings us to a point to consider. If you choose a handgun, you will have a choice between high-capacity weapons such as most semi-auto guns or revolvers, which usually only hold five to six shots. When deciding, make certain that you will have the ability to reload quickly if the need arises. 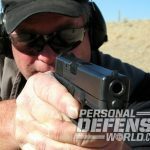 One unique pro found in handguns compared to others weapons is their ability to be used one-handed. This is critical when you may need to hold a flashlight or even a child. The cons of handguns are evenly balanced. While the term “stopping power” can be vague, handguns generally are the least powerful of our three choices. Scientifically, the energy that is delivered by a handgun round is about a quarter of that found in 12-gauge buckshot and a third of what we find in an AR-style rifle. 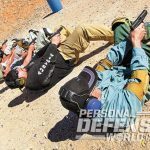 Handguns tend to be the most difficult weapons to shoot accurately as well. Their short sight radius mixed in with a trigger that requires more pull than the gun weighs can be a challenge. If you choose a revolver, then reloads will be a challenge. Unless you are Jerry Miculek, reloading your revolver will take precious time. 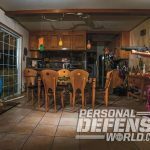 Handgun rounds have a high probability of penetrating most home surfaces as well. This is important to consider if you live in an apartment with little more that two sheets of drywall between you and neighbors. 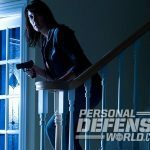 Of all the choices we have, the handgun is the one that requires the greatest degree of training and proficiency to use effectively inside the home. 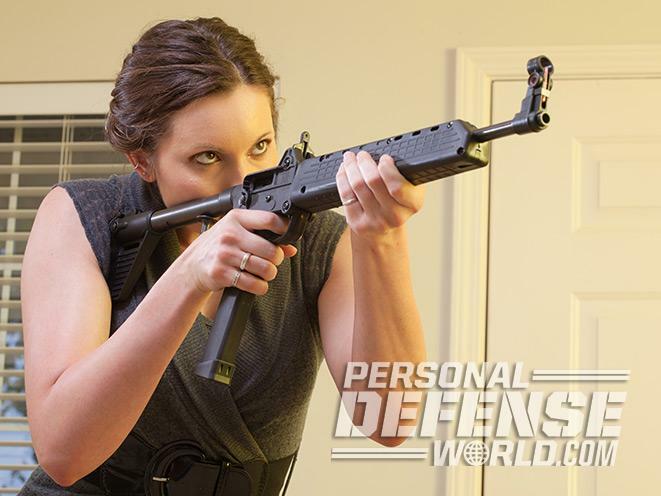 As with pistols, we have many options when it comes to what type of rifle we would choose for home defense. 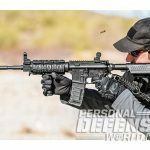 To keep us from getting lost in the weeds, we will look at the most popular rifle for the task: the .223/5.56mm AR-15 carbine. 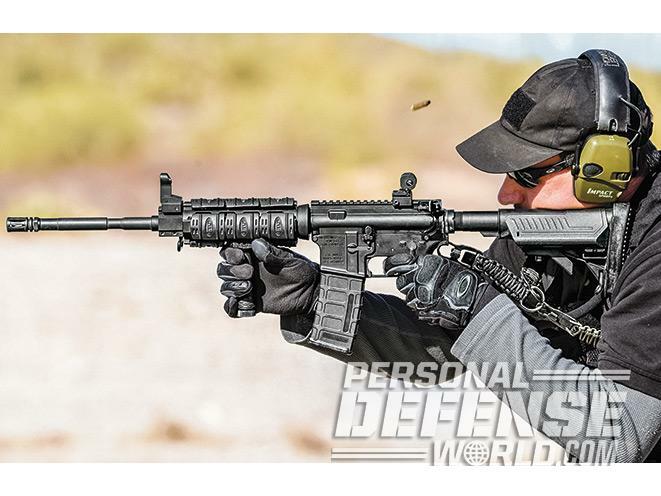 The carbine offers a more stable platform and is easier to shoot accurately under stress. With the ability to stabilize the gun against your shoulder and the addition of a red-dot optic and lights, the gun becomes very accurate. Unless you live in an anti-gun state, you will have the ability to use 30-round magazines with your rifle. This is by far the optimal setup for a gun. Having a large amount of ammunition allows you the ability to deal with a threat for a longer period of time before you must reload. Rifle rounds are superior to handgun rounds because of their velocity and fragmenting nature. With this they have a higher probability of stopping an adversary with fewer shots. The cons of rifles begin with their size. 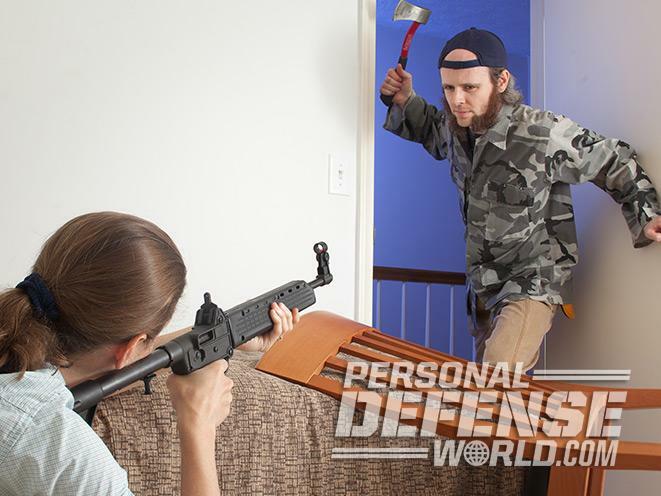 A rifle is more difficult to maneuver through a home and requires special training to do it right. The velocity of the round can also be a con. While it provides effective wound channels, it has to hit the mark. Finally, you need to consider cost. Compared to a handgun, a well-made rifle can cost as much as two to three times more. This is prior to any additions made to the gun, such as lights, lasers or optics. 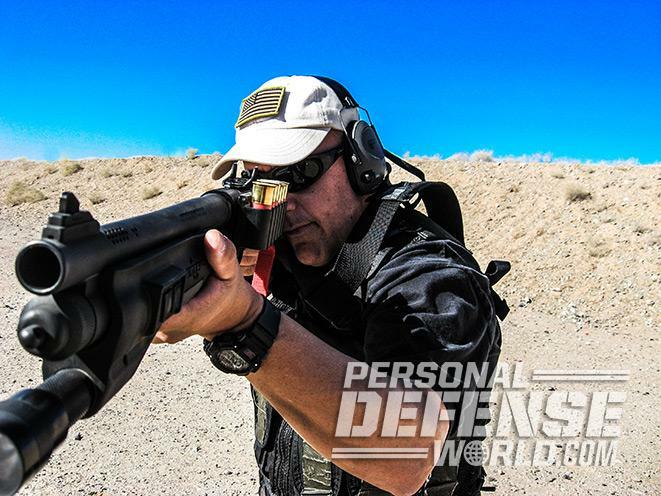 The pros of a shotgun are many, yet some perceived pros tend to be myth. While it will not blow a grown man off the floor and though a window, it does provide an exceptional punch. 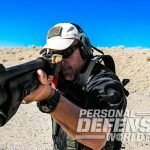 Using defensive buckshot ammunition, the shotgun has real-world stopping power. 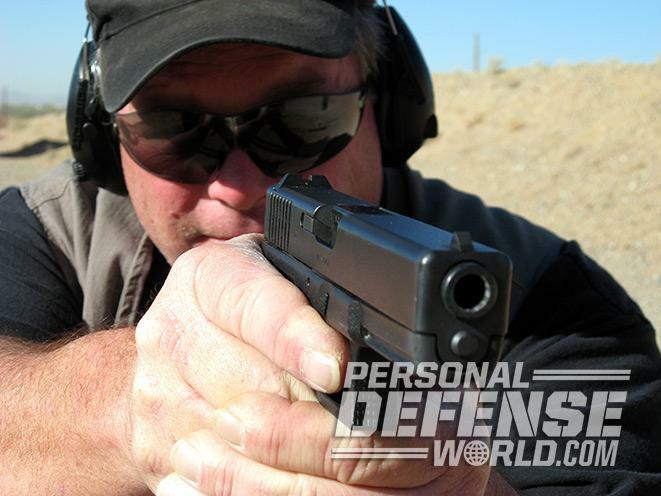 A well-placed shot can deliver nine .380 ACP-sized shots into a small target simultaneously. As with the rifle, it is a longer and more stable weapon to shoot and, when equipped with optics and a light, tends to be more accurate. The biggest con against a shotgun is its size. The long barrel that helps us get such accuracy makes it tough to move around corners and through doors. A very close second is recoil. Shotguns fire a large round package, and the push of that is real. For the untrained and those who do not practice regularly, it can be overwhelming. We must also deal with the aiming myth of shotguns. Yes, you still need to aim. As we discussed previously, the spread for a shotgun in indoors distances is small. You can miss your target if you do not aim correctly. One last thing to consider as a con of shotguns is the reload. Shotguns are notoriously difficult to reload under stress. With their internal capacity ranging from five to eight rounds, the chances that you will need to reload is high. This requires training. It would be difficult to just blatantly state that this gun is better than that gun. There are many moving parts that will go into your decision and you should weigh each one intensely. 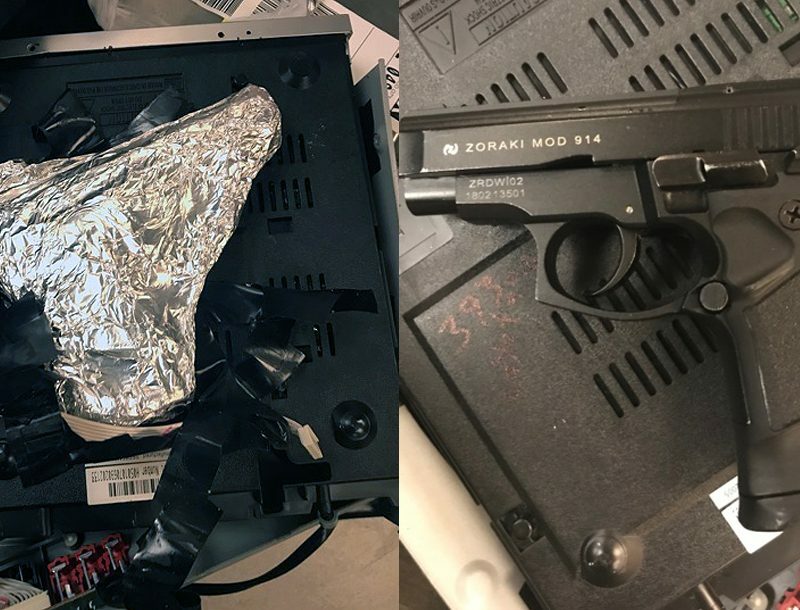 To survive a situation that forces you to break out a gun, you must have done your homework. Which gun do you shoot the best? How big is your home? What can you afford? These are not trivial matters, and they must be thought out before you make your choice. The most important factor with any weapon is training. Under stress, you will not be the master marksman you may enjoy being on the range. Your groups will open up as your adrenaline starts pumping. The best way to prepare is through serious training and practice. Safely do a walkthrough in your home to find the tricky corners and blind spots. Consider all of this and choose wisely. These Taurus autos and revolvers are built to respond with threat-stopping power!